• The number of new cases is expected to rise by about 70% over the next 2 decades. • Cancer is the second leading cause of death globally, and was responsible for 8.8 million deaths in 2015. Globally, nearly 1 in 6 deaths is due to cancer. • Approximately 70% of deaths from cancer occur in low- and middle-income countries. 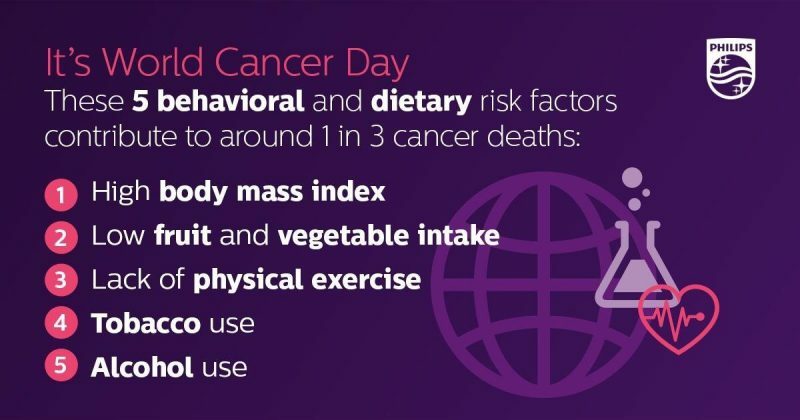 • Around one third of deaths from cancer are due to the 5 leading behavioral and dietary risks: high body mass index, low fruit and vegetable intake, lack of physical activity, tobacco use, and alcohol use. • Tobacco use is the most important risk factor for cancer and is responsible for approximately 22% of cancer deaths. • Cancer causing infections, such as hepatitis and human papilloma virus (HPV), are responsible for up to 25% of cancer cases in low- and middle-income countries. • Late-stage presentation and inaccessible diagnosis and treatment are common. In 2017, only 26% of low-income countries reported having pathology services generally available in the public sector. More than 90% of high-income countries reported treatment services are available compared to less than 30% of low-income countries. • The economic impact of cancer is significant and is increasing. The total annual economic cost of cancer in 2010 was estimated at approximately US$ 1.16 trillion. • biological carcinogens, such as infections from certain viruses, bacteria, or parasites. WHO, through its cancer research agency, International Agency for Research on Cancer (IARC), maintains a classification of cancer-causing agents. Aging is another fundamental factor for the development of cancer. The incidence of cancer rises dramatically with age, most likely due to a build-up of risks for specific cancers that increase with age. The overall risk accumulation is combined with the tendency for cellular repair mechanisms to be less effective as a person grows older. 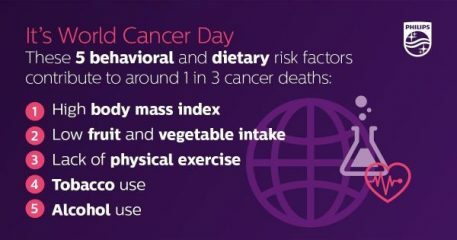 Tobacco use, alcohol use, unhealthy diet, and physical inactivity are major cancer risk factors worldwide and are also the 4 shared risk factors for other noncommunicable diseases. Some chronic infections are risk factors for cancer and have major relevance in low- and middle-income countries. Approximately 15% of cancers diagnosed in 2012 were attributed to carcinogenic infections, including Helicobacter pylori, Human papillomavirus (HPV), Hepatitis B virus, Hepatitis C virus, and Epstein-Barr virus). Hepatitis B and C virus and some types of HPV increase the risk for liver and cervical cancer, respectively. Infection with HIV substantially increases the risk of cancers such as cervical cancer. Between 30–50% of cancers can currently be prevented by avoiding risk factors and implementing existing evidence-based prevention strategies. The cancer burden can also be reduced through early detection of cancer and management of patients who develop cancer. Many cancers have a high chance of cure if diagnosed early and treated adequately. • indoor smoke from household use of solid fuels. Tobacco use is the single most important risk factor for cancer and is responsible for approximately 22% of cancer-related deaths globally (2). • reduce exposure to ionizing radiation (occupational or medical diagnostic imaging). Vaccination against these HPV and hepatitis B viruses could prevent 1 million cancer cases each year (3. When identified early, cancer is more likely to respond to effective treatment and can result in a greater probability of surviving, less morbidity, and less expensive treatment. Significant improvements can be made in the lives of cancer patients by detecting cancer early and avoiding delays in care. Early diagnosis is relevant in all settings and the majority of cancers. In absence of early diagnosis, patients are diagnosed at late stages when curative treatment may no longer be an option. Programmes can be designed to reduce delays in, and barriers to, care, allowing patients to access treatment in a timely manner. Screening aims to identify individuals with abnormalities suggestive of a specific cancer or pre-cancer who have not developed any symptoms and refer them promptly for diagnosis and treatment. Screening programmes can be effective for select cancer types when appropriate tests are used, implemented effectively, linked to other steps in the screening process and when quality is assured. In general, a screening programme is a far more complex public health intervention compared to early diagnosis. • mammography screening for breast cancer in settings with strong or relatively strong health systems. A correct cancer diagnosis is essential for adequate and effective treatment because every cancer type requires a specific treatment regimen that encompasses one or more modalities such as surgery, radiotherapy, and chemotherapy. Determining the goals of treatment and palliative care is an important first step, and health services should be integrated and people-centred. The primary goal is generally to cure cancer or to considerably prolong life. Improving the patient's quality of life is also an important goal. This can be achieved by supportive or palliative care and psychosocial support. Some of the most common cancer types, such as breast cancer, cervical cancer, oral cancer, and colorectal cancer have high cure rates when detected early and treated according to best practices. Some cancer types, even when cancerous cells have traveled to other areas of the body, such as testicular seminoma and leukaemias and lymphomas in children, can have high cure rates if appropriate treatment is provided. Palliative care is treatment to relieve, rather than cure, symptoms caused by cancer and improve the quality of life of patients and their families. Palliative care can help people live more comfortably. It is an urgent humanitarian need for people worldwide with cancer and other chronic fatal diseases and particularly needed in places with a high proportion of patients in advanced stages of cancer where there is little chance of cure. Relief from physical, psychosocial, and spiritual problems can be achieved in over 90% of advanced cancer patients through palliative care. In 2017, the World Health Assembly passed the resolution Cancer Prevention and Control through an Integrated Approach (WHA70.12), urging governments and WHO to accelerate action to achieve the targets specified in the Global Action Plan and 2030 UN Agenda for Sustainable Development to reduce premature mortality from cancer. • provide technical assistance for rapid, effective transfer of best practice interventions to countries. Lyon, France: International Agency for Research on Cancer; 2013. (2)GBD 2015 Risk Factors Collaborators. Global, regional, and national comparative risk assessment of 79 behavioural, environmental and occupational, and metabolic risks or clusters of risks, 1990-2015: a systematic analysis for the Global Burden of Disease Study 2015. Lancet. 2016 Oct; 388 (10053):1659-1724. 3Plummer M, de Martel C, Vignat J, Ferlay J, Bray F, Franceschi S. Global burden of cancers attributable to infections in 2012: a synthetic analysis. Lancet Glob Health. 2016 Sep;4(9):e609-16. doi: 10.1016/S2214-109X(16)30143-7.